Arrive at Siem Reap International Airport in Cambodia and get transferred to hotel. Check-in at the hotel and freshen up. Proceed to visit the popular Southern Gate of Angkor Thom with Bayon, Elephants and Leper King Terrace, Baphoun, Phimean Akas. Enjoy a scenic sunset at Bakheng Mountain. Return to your hotel by evening. After the day long tour, enjoy a fun-filled local dinner with Apsara Dance Show. Spend the night at the hotel in Siem Reap. After breakfast, proceed to witness some of the popular monuments of Siem Reap. 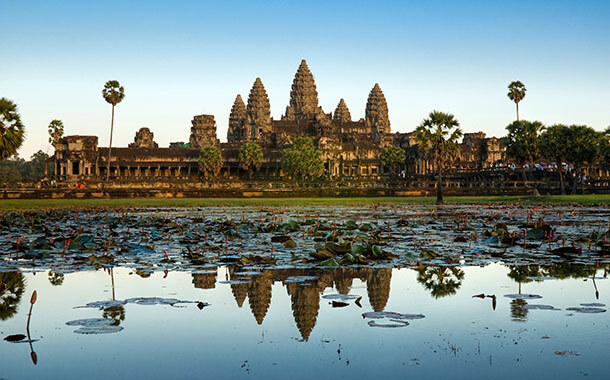 Visit the magnificent temple of Angkor Wat, the largest and best preserved monument of the Angkor complex. Local lunch will be followed by an excursion to Ta Prohm, a jungle temple built in 1186. 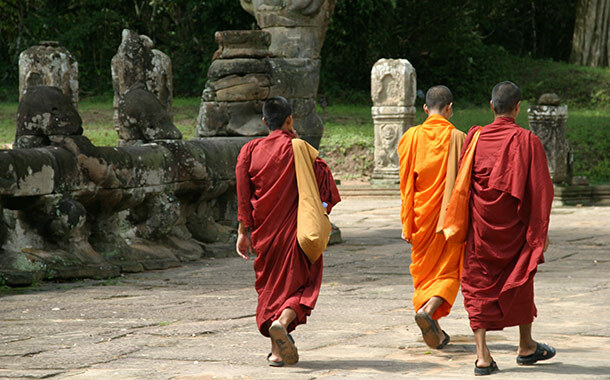 Visit Pre Rup, Preah Khan Temple, Neak Pean Temple. Return to the hotel in Siem Reap for an overnight stay. Have your breakfast at the hotel. Visit the Banteay Srei - a 10th century Cambodian temple and Kbal Spean – an archaeological site. A short trek will take you to Kbal Spean – a spectacularly carved riverbed set deep in the jungle. After lunch, visit the Akira Landmine Museum to learn about the history of war and weapons which were used in Cambodia war from 1970 – 1993. A private transfer will take you to the Siem Reap airport to board a flight to Phnom Penh. Upon arrival head to the hotel for a comfortable overnight stay. Enjoy your breakfast and later check-out from the hotel. 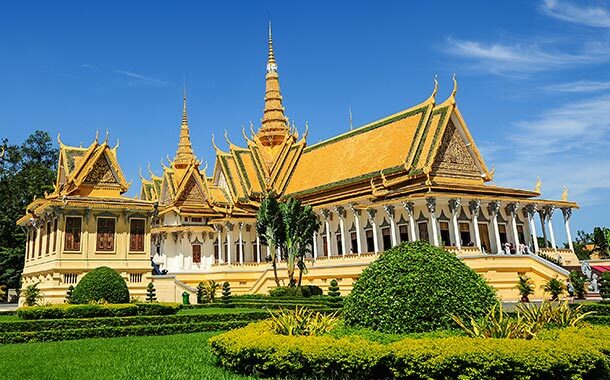 Visit the majestic Royal Palace with Silver Pagoda. During the tour, also visit the Genocide Museum to get an insight into the Khmer Regime atrocities. Enjoy lunch at a local restaurant and later enjoy some shopping at the popular Central Market. Proceed to Phnom Penh International Airport and to catch an evening flight to Ho Chi Minh City or Saigon as it is popularly called. Get private transfers to the hotel. Spend the overnight at the hotel. After breakfast at the hotel, proceed for a tour of Cu Chi Tunnel area. Visit a network of 200km long underground dug-out which was being used during the Vietnam - USA war. Return back to the hotel for an overnight stay. Return back to Ho Chi Minh city and enjoy a local lunch at a restaurant. Thereafter this afternoon visit the Reunification Palace, which has huge historic importance in Vietnam War that ended in 1975. This grand building has been converted to a Museum and Hall for official receptions. Nearby are the colonial – styled Post Office and Notre Dame Cathedral, built between 1877 and 1833 and is one of the major city landmarks. Head back to the hotel in Ho Chi Minh city and spend a relaxing night in the comfort of your room. After breakfast, get ready for a scenic journey along the National Highway bordered by green rice fields. Arrive at My Tho city and visit the Vinh Trang pagoda. Take a leisurely boat ride along the river. Proceed to Tortoise islet. Enjoy lunch at the orchard garden. Later, take a boat ride to An Khanh. Visit a family business which epitomises the idyllic rural lifestyle, taste the delicious coconut candy and observe the pastoral life as you roam through the fruit plantation and village. Return back to the Ho Chi Minh City and spend the overnight at the hotel. Have a lovely breakfast and take your private transfer to the Tan Son Nhat International Airport in Ho Chi Minh for your flight to Hue. Upon arrival at Phu Bai International Airport in Hue, we shall transfer you to a city tour. Proceed to the pier for a motor dragon boat ride along Perfume River. On board, witness the magnificent architecture of 17th century with Thien Mu pagoda. Also visit the Imperial Citadel, Flag Tower, NoonGate, Nine Dynasty Urns, Nine Holy Cannons, Thai Hoa Palace. Enjoy lunch at a local Vietnamese restaurant. Later, proceed to visit the King’s Tombs of Tu Duc, handicraft villages such as conical hat making, bronze-casting, incense-making. Return back to the hotel in Hue for an peaceful overnight stay. Tuck in a delicious breakfast today morning. Clear all your extras and check out from the hotel. A private vehicle will take you to Hoi An. Enroute enjoy the lovely untouched landscape of Lang Co Beach and Hai Van Pass or the ‘Cloudy Mountain Pass’. Spend the day enjoying this quaint ancient town of Hoi An. Walk over the tile roofed Japanese Bridge, visit taciturn Chinese Assembly Halls and trading houses, Pagodas and stroll in the market located by the Thu Bon River. 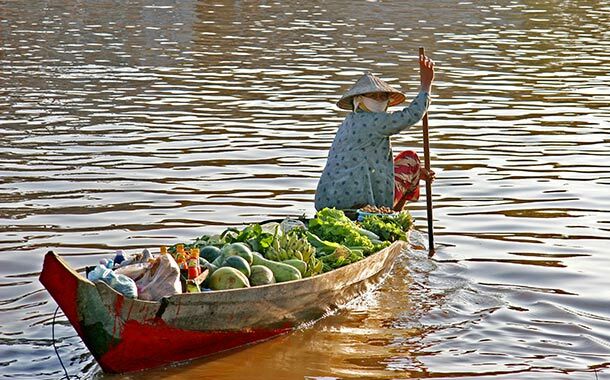 Experience first-hand the magical old world Oriental charm of Hoi An which has been a source of inspiration to many artists and their creations. Lunch at a local restaurant followed by a leisurely visit to some of the shops in the Old Town are a perfect end to this beautiful day. Spend the night in Hoi An at the comfort of your room. After breakfast, spend a leisurely morning while you wait for your transfer to the Hoi An airport to catch a flight to Hanoi. Get ready for a full day city tour of Hanoi. Visit the Ho Chi Minh Complex, including Ho Chi Minh’s Mausoleum and Ho Chi Minh Museum. Further, visit One Pillar Pagoda and the Temple of Literature. Take a break and enjoy your lunch at a local restaurant. After lunch, visit Tran Quoc Pagoda, the Museum of Ethnology, Hoan Kiem Lake and Ngoc Son Temple. Return back to the hotel in Hanoi for an overnight stay. After breakfast, proceed to Halong Bay on an approximately three hour drive. Arrive at Halong Bay and board a junk boat, a chinese sailing vessel. Enjoy your lunch on-board, cruise to majestic Halong Bay and admire several landscapes of Dinh Huong Island, Duck Island, Dog Island, Sail island. Visit Pearl village. Explore Titop beach and Soisim beach. In the evening, attend cooking class on-board. Enjoy your dinner while enjoying film entertainment. Adventure lovers can join squid fishing from the boat with the crew. Retire to your cabin for an overnight stay. Have breakfast on-board. Enjoy the sunrise; go swimming in the emerald waters of Halong Bay. Explore the ‘Surprise Cave’ in Halong Bay. Check-out from the boat and enjoy your lunch on the way back to Halong city. Reach your hotel in Hanoi and spend some relaxing time. After breakfast, check out from the hotel. Get transferred to Noi Bai International Airport to catch your flight back home. Return back home with excellent knowledge about the history of Cambodia and Vietnam and lifetime memories of this holiday. Note - Above prices are valid till May 1, 2016. *Prices are quoted per person on a twin-sharing basis in a budget hotel with above specified meals, mentioned tours and airport transfers. All transfers and sightseeing as per itinerary are on sharing basis. Any increase in airfare, air taxes, YQ tax, visa charges will be charged extra. Additional options are available upon request. Prices are correct at the time of publication and are subject to change without any prior notice depending on travel dates and availability. Terms apply.